How can I help best? STOP OMV – No more drilling! Climate Justice Taranaki questions the environmental and economic arguments for the Taranaki Hydrogen Roadmap released on Friday. “The roadmap is full of fanciful ideas and technologies that are unproven and still at the experimental or development stages. They are fine if we have lots of time, but we are in a climate emergency. With just 12 years left to turn things around, we need to act fast by upscaling proven renewable energy technologies, and investing in energy conservation and resilience,” said Catherine Cheung, spokesperson for Climate Justice Taranaki. “We agree that there may be a niche role for green hydrogen – hydrogen produced by water electrolysis with renewable energy – in fueling long-haul, heavy transport to reduce our greenhouse gas emissions from this sector. But the heavy emphasis given to the production of ammonia, urea and methanol, whether using green or blue hydrogen, is a worry,” said Cheung. Blue hydrogen is produced from natural gas and requires carbon capture and storage (CCS). According to the Global CCS Institute, there are only 18 commercially operating CCS facilities in the world. Many of these inject the captured carbon dioxide underground to force out more oil from old oil fields, gaining carbon credit while continuing to mine fossil fuels. Locally in Taranaki, there have been documented problems in deepwell injection operations including well leakage. “Carbon capture and storage is only meaningful if longterm, secure storage can be guaranteed. But who would monitor and make sure that the gases do stay in the ground? Who would be liable if there is a leakage, posing harm to humans and the environment, after companies have left?” asked Cheung. In the roadmap, ‘green’ urea and methanol are supposedly green because they do not rely on fossil fuels in their manufacturing. But when urea is spread on land, nitrous oxide is released into the atmosphere. Nitrous oxide is 268 times more potent than carbon dioxide as a greenhouse gas. Pouakai NZ, a subsidiary of 8 Rivers, aims to produce 2 million tonnes of urea a year from its proposed gas-fed power plant and hydrogen production facility at Port Taranaki. “If the 8 Rivers project goes ahead, it would drive further gas exploration and industrial agriculture. The last thing we want is more industrial farming which disrupts our climate and degrades our waterways and soil. There really is no such thing as green urea,” said Cheung. What about green methanol? The roadmap describes plastics made from methanol to be derived from captured carbon dioxide and renewable hydrogen as ‘carbon negative’. “But do we want yet more plastics to clog up our oceans and poison our ecosystems?” asked Cheung. The roadmap also touts the possibility of exporting green hydrogen as a ‘renewable energy to meet global demand’. Wouldn’t that compete with the domestic demand for renewable energy that we need ourselves to transition to zero carbon, and drive electricity price up? “Why are we investing so much on a roadmap that does little to address our energy security and transport emissions, and potentially increases agricultural emissions? It appears to be more smoke and mirrors trying to keep the fossil fuel and petrochemical industries afloat despite our climate crisis,” concluded Cheung. Our group cautions the heavy emphasis and investment on hydrogen and the reliance on existing petrochemical infrastructure to produce it. The hydrogen roadmap for Northern Netherlands explains that in order to make hydrogen economical, lots of it must be produced. And the first market for hydrogen must be the chemical industry which uses hydrogen as feedstock, to make things like ammonia and urea. One problem is that it takes lots of renewable energy to make green hydrogen – it takes three times more energy to power a hydrogen car than an electric one. And we haven’t begun to address transport or agricultural emissions which are the two biggest in New Zealand. There are really more urgent priorities that need to be addressed, like energy and food security for communities. If we put more efforts into developing community-based renewable energy production and distribution networks, we would reduce the overall burden on the central network and build community resilience as climate extremes become more prevalent. We would have more electricity to power our transport fleet, including public transport, trucks, trains and even boats. If we support and invest in local food production rather than industrial agriculture for export, we would not be so vulnerable to fluctuating commodity and fuel prices. Communities would be better able to feed themselves and ensure well-being. On Wednesday 20th February members of Climate Justice Taranaki will be restarting ongoing protests at the headquarters of climate polluters in Taranaki. 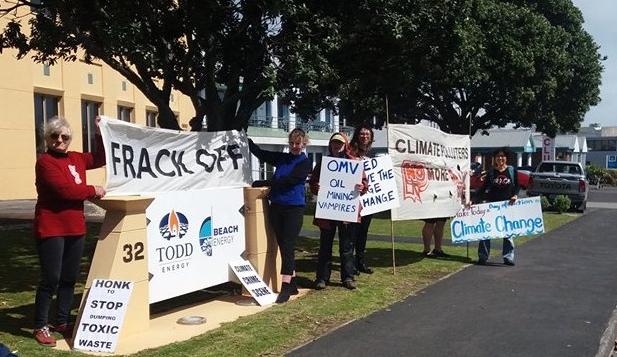 This week, the group is going to Todd Energy and OMV from 12pm, at 32-38 Molesworth St, New Plymouth to demonstrate continued opposition to oil and gas drilling. “We are currently witnessing an unprecedented global youth movement in defence of the climate. Students from across the world are going on strike and taking inspiring actions to demand urgent system change. If we want to have any chance of a stable climate for future generations, we have to stop extracting fossil fuels now” says Urs Signer, spokesperson for Climate Justice Taranaki. “What we need is an urgent and just transition away from fossil fuels, industrial agriculture and a greedy economic system that is based on destroying the environment, communities and people’s livelihoods for the benefits of the one percent. Our message to the companies and the rich and powerful is this: your time is up. We can now choose between extinction or rebellion – and the striking students across the globe are telling us – it’s time to rebel in defence of our climate” concludes Urs Signer. Climate Justice Taranaki is skeptical of public workshops beginning this week on a ‘Taranaki 2050 Roadmap’. The workshops continue the Tapuae Roa strategy and action plan recently written by the Ministry for Business Inovation and Enterprise (MBIE), the four councils and business heads with only some iwi input. “The idea of this just transition plan sounds great but in reality it’s the same old profit-driven, environmentally and socially destructive global capitalist model. This is the exact model that in only a few generations brought us to the crisis we now face. What’s more, the community is only getting a say once they already agreed on the core of the plan and the workshops are being held during work hours when most people can’t participate. It’s unworkable and unjust.” says spokesperson Emily Bailey for Climate Justice Taranaki. “We have to face the fact that a just transition involves much more than phasing out fossil fuels. A just transition must address the fact that all natural resources and ecosystems are on the brink of collapse due to our modern take, use and trash lifestyles. We need to shift our economic focus to the local community level. We need to rehabilitate native ecosystems such as fisheries and decentralise and connect communities with diverse farms and workshops that provide food and other products for locals. This is just transition. Our current trajectory is extinction and the only alternative is rebellion to the status quo.” concludes Bailey. Climate Justice Taranaki are extremely disappointed at Commissioner Daysh’s decision to approve the Mt Messenger Bypass. “To smash yet another pointless road through a wild valley with threatened endemic species is insane. We are in the middle of a climate emergency and a mass species extinction yet the crown’s NZTA dinosaur organisation still cannot see the writing on the wall. Wrecking forest, wetland and awa to save a dying trucking industry a few dollars and four minutes travel time is reckless, especially when funded by public money. No mitigation will ever cover what has been destined for destruction and this country should be ashamed of yet another ‘clean, green’ fallacy.” said spokesperson Emily Bailey. The group are considering appealing the decision in a hope to stop any future roads like this ever being approved in the country. Direct action is also being discussed. “We call on Ministers Phil Twyford and Julie Anne Genter to do what they can to prevent future disasters like this from being made. Repairing Aotearoa’s main trunk line for freight and passengers, expanding public transport, developing electric vehicle infrastructure and extending cycle lanes and walkways are the ways to go, not this backwards diesel disaster.” said Bailey. Press release: Sustainable hydrogen or oxymoron? So on the same day when Regional Economic Development Minister Shane Jones spoke of a potential, “monumental” one billion dollar project that would “create hydrogen and create an output of urea” it leaves you wondering what exactly the government thinks cutting emissions by half really means. “There’s a saying: ‘rolling a turd in glitter’ and that’s exactly what Shane Jones is offering” says Climate Justice Taranaki spokesperson Emily Bailey. “This second round of unsustainable Think Big technology is not proven and even if it was it will be ridiculously expensive and still require fracked gas that is estimated to run out in ten years time. Who in their right mind would invest in such a project?”. The project has been touted by the US based 8 Rivers Capital LLC. According to their website, the company has developed technology to generate power from fossil fuels, apparently without air emissions, the only by-products being ‘water’ and “pipeline-ready” or “carbon capture-ready” carbon dioxide. “There is a huge push from society for real solutions, just look at the massive protests in London this week and the numerous petitions pushing for going plastic-free and banning urea, deep-sea oil and fracking. More of the same gives us more of the same. It’s time to focus on existing, proven sustainable projects rather than expensive, massively flawed pies in the sky” said Emily Bailey of Climate Justice Taranaki. Climate Justice Taranaki has been denied information regarding legal advice sought by the Environmental Protection Authority (EPA). The advice concerned processing of OMV’s consent applications for its oil drilling programme in the Taranaki Basin. “At the EPA hearing on OMV’s marine discharge consent application in September, we argued that the application should be jointly processed with all other applications associated with the drilling programme. We asked that legal advice be sought on this matter. Subsequent to the granting of the consent on the 4th October, we wrote to EPA, requesting clarifications and documents relating to any legal advice that EPA might have received. A month later, EPA replied, confirming that there had been legal advice but the relevant documents would be withheld ‘in order to maintain legal professional privilege’. We feel this is not natural justice,” said Catherine Cheung, Researcher of Climate Justice Taranaki. “Tomorrow we will be holding a protest at the Quality Hotel Plymouth International where EPA will hear Tamarind Taranaki Limited’s drilling and discharge consent applications. While Tamarind’s proposed activities are publicly notified, OMV’s application to drill 12 new exploratory/appraisal wells across six licensed areas in the Taranaki Basin is non-notified. According to the Crown Minerals Act, if OMV finds any viable oil and gas, mining licenses spanning decades will be granted. All this is allowed to happen behind closed doors. What about transparency and democracy?” asked Cheung. “A vast majority of the 6539 submitters on the Crown Minerals Amendment Bill supports the Bill and wants it strengthened, by putting an end to all new and existing oil and gas exploration and mining, on and offshore. The overriding message is loud and clear: Real action to cut greenhouse gas emissions is long overdue. Time is running out. We cannot say that climate change is our nuclear free moment while allowing companies to extract more fossil fuels. Climate inaction is not only costly, but constitutes moral negligence,” added Cheung. “The legislation is full of loop-holes and biased in favour of the industry. The EEZ Act explicitly excludes consideration of emissions on climate change. This is crazy, at a time when climate disruptions are threatening our very existence. We challenge the EPA over its petroleum consenting process which appears to be little more than a tick box exercise,” said Emily Bailey, Spokesperson of Climate Justice Taranaki. Download slides presented by Dr L DeVantier and CJT at the EPA Tamarind hearing. Kia ora, Climate Justice Taranaki is a community group dedicated to justice, resistance, education and positive action at the front lines of climate change. TEW is challenging the proposed S. Taranaki District Plan, to get the best protection for local communities and the environment, from harmful impacts of the oil/gas industry. Give your support to make it possible. See the team in action: http://www.stuff.co.nz/taranaki-daily-news/news/80877839/energy-watchdog-calls-for-more-controls-on-oil-and-gas-industry Photo by C.Groenestein. Right click on image to see full map and text. Keep the oil and gas companies out of Taranaki. Know your rights and join others locking the gate in NZ and Australia.